Carrizo Springs Intermediate Hosts Orbit Earth Expo! 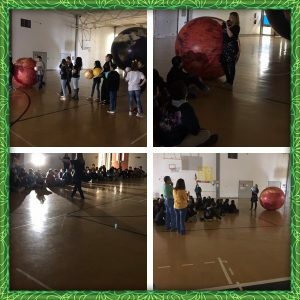 CARRIZO SPRINGS, TEXAS – Orbit Earth Expo visited Carrizo Springs Intermediate on Friday for a fun day of astronomy programs for the 5th graders! Kimberly had a great day with the kids and commented on how well-behaved and knowledgeable they were, especially about reflection and refraction and some fun facts about the sun! One student even pointed out to Kimberly that the sun was technically 92.96 million miles from the sun, but it is okay that she rounds to 93 million. We enjoyed the banter with the kids – we know our jokes are corny, but the kids agreed that we should keep them in the program. Thanks, guys! We had a great time rotating, revolving, eclipsing, and phasing with you! Hope to see you again next year!